Gingermelon Dolls: Free Pencil/Glasses Case Pattern! 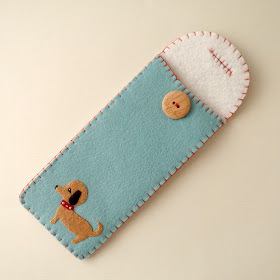 Here's a little special something for you to make! 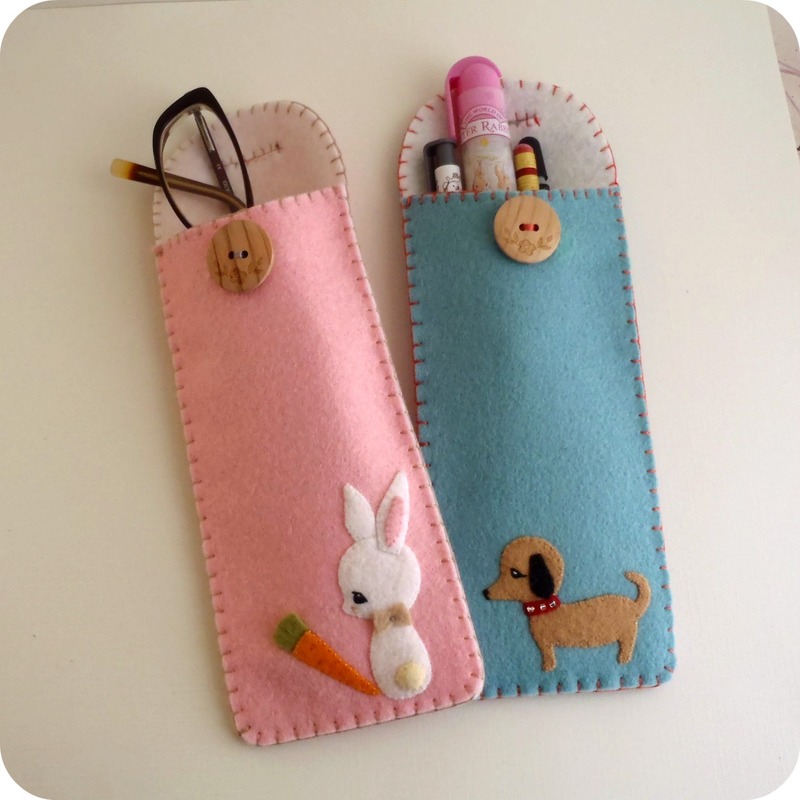 These pretty cases are perfect for keeping your glasses safe, or holding pens and pencils. They're easy to make and you can download the pattern pieces here. 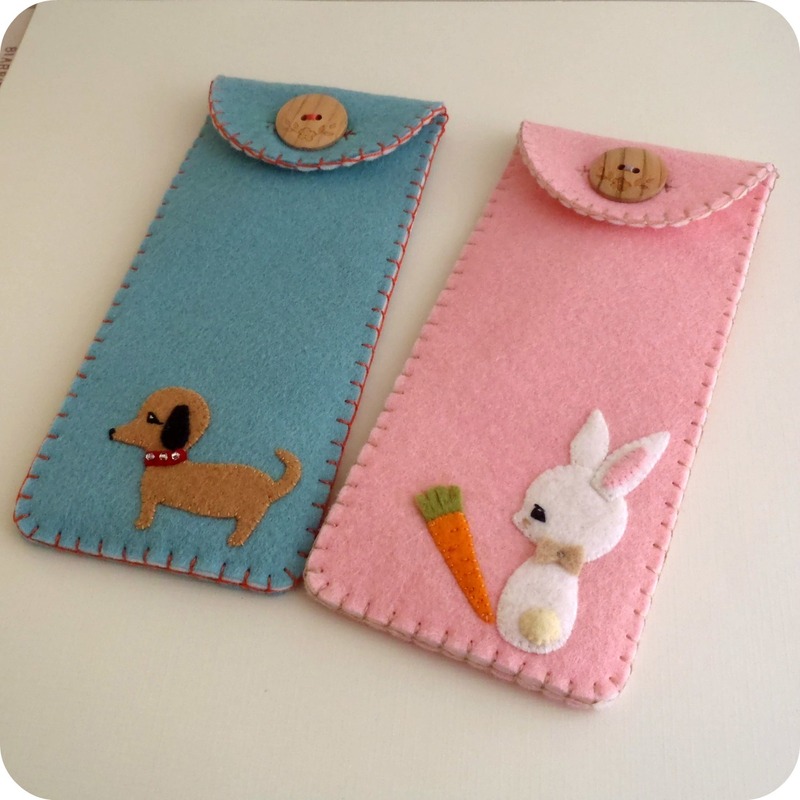 : Cut our your pattern pieces and lay each piece onto your chosen felts. Carefully cut out. 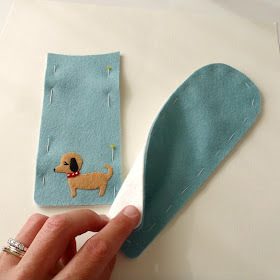 Tip: A sharp pair of long-nosed embroidery scissors are perfect for cutting around the tiny curves on the bunny and dog. 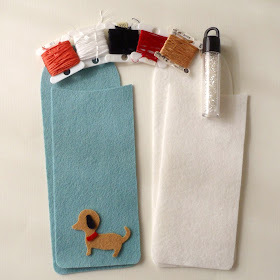 : Position dog body onto main colour of bag front. Applique all around outer edge. Using your water soluble pen, mark a little eye and a tiny snout. : Embroider eye and snout on with black thread, adding a tiny white stitch to his eye to create an illusion of light reflecting off the eye. 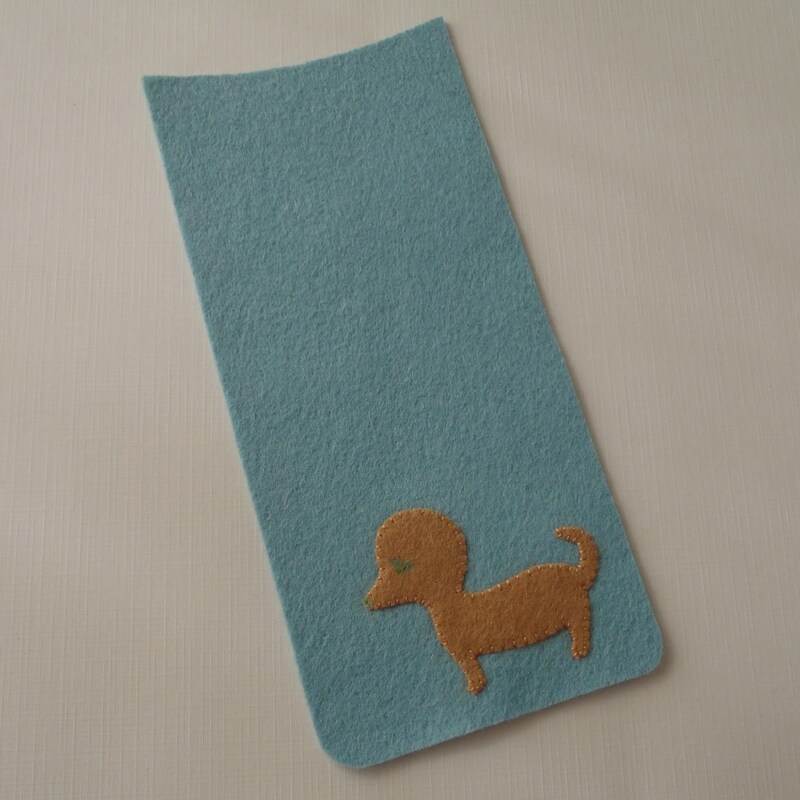 : Place ear onto head and applique on and then position collar on and applique on. If you like, sew three seed beads onto the collar. : Pin both pieces of bag front as well as both pieces of bag back together. Baste pieces together. 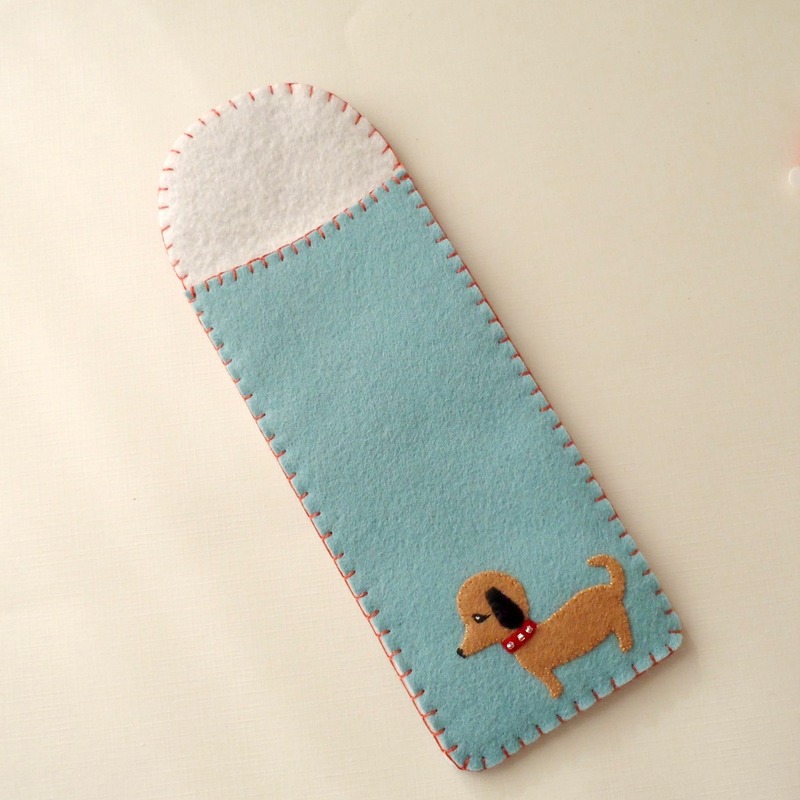 This will keep the front and back pieces from sliding out of place when you sew the two sides together. : Blanket stitch top edge of bag front. Pin front of bag to back of bag. : Blanket stitch all the way around outer edge. Remove basting stitches. 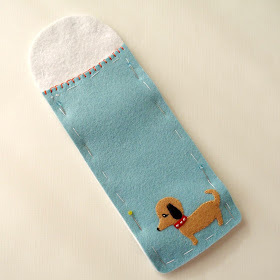 : Sew a button onto the front, fold over flap and mark button hole placement. Being very careful, cut slit with your exacto blade. To keep the hole from warping, blanket stitch around opening of button hole. And you're done! 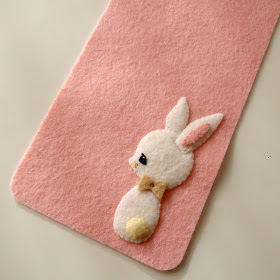 : Firstly, you'll need to determine the placement of your bunny in order to know where to place his back ear. Position bunny onto main colour of bag front. Tuck the back ear behind the head so that the head just slightly overlaps the bottom of the ear. 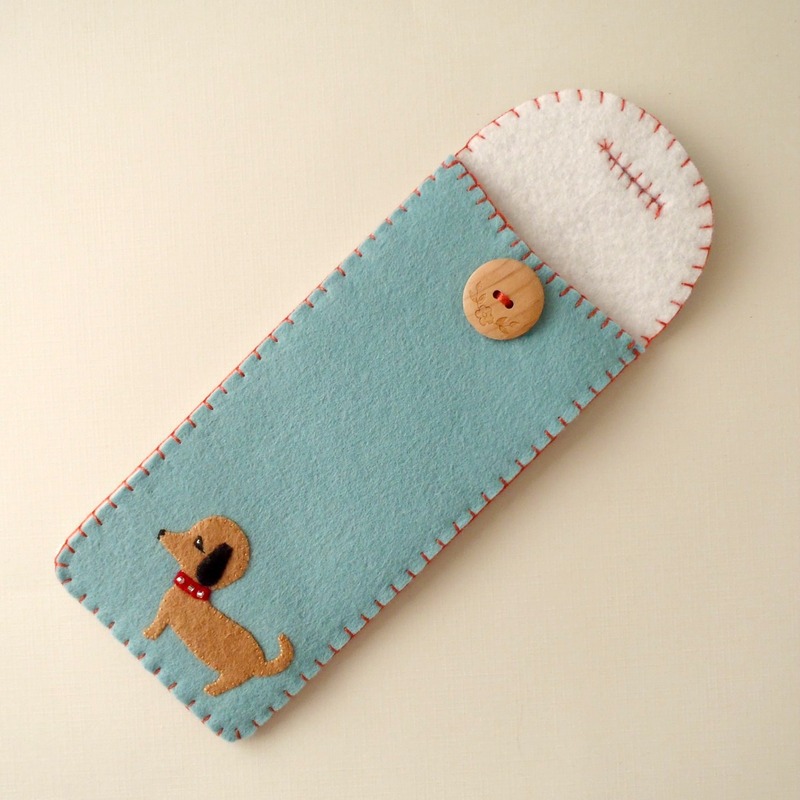 You can also use the front ear to help with the placement. Once you're happy with the placement, carefully remove the body/front ear and applique back ear in place. 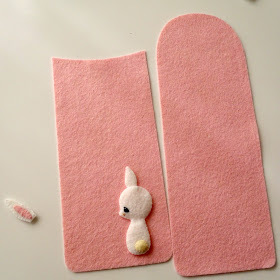 : Applique tail onto body and add a teeny pinch of stuffing before closing. Applique inner ear onto front ear. : Position bunny body in place and applique in place. Follow the directions above to make the eye and add two little whiskers. 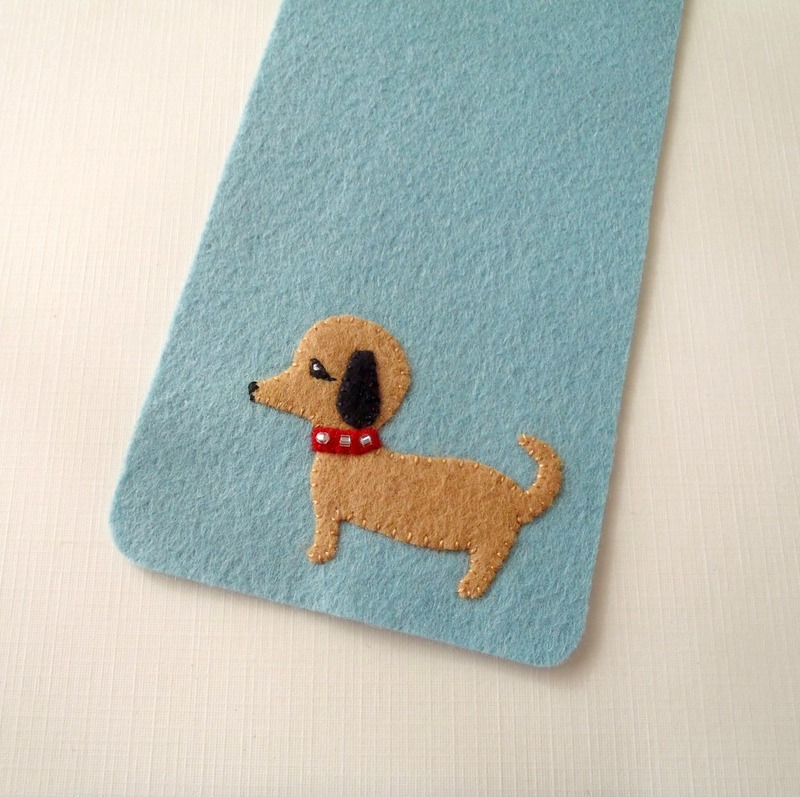 : Place front ear in place and applique in place. Sew the bow on at the neck using a few tiny stitches in the centre to keep it in place. 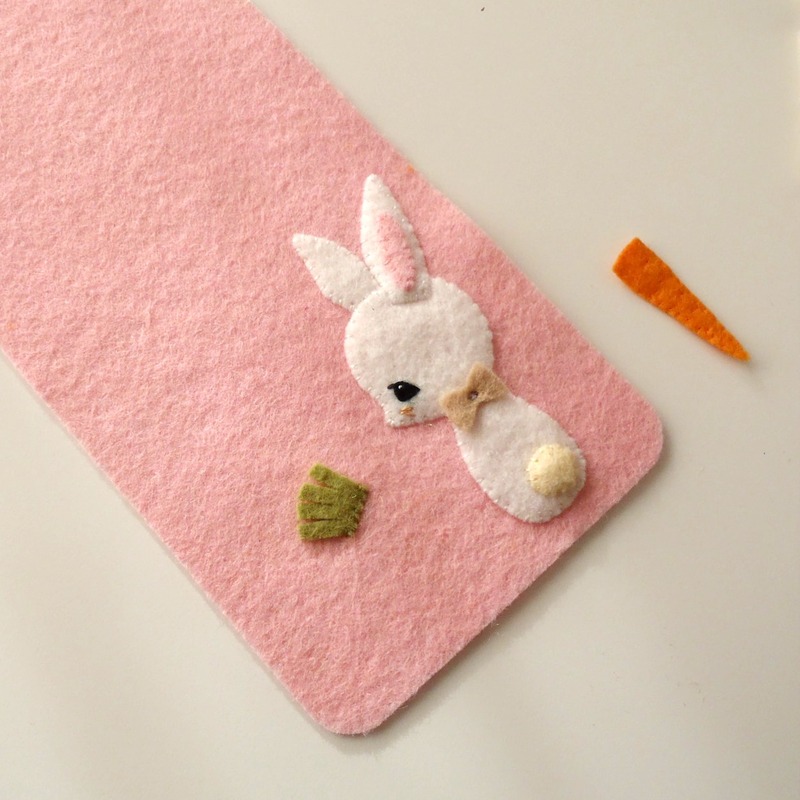 : As in the first step, determine where you'd like to place the carrot and tuck the carrot greens behind the carrot. Applique bottom edge of greens onto front of bag. : Place carrot onto greens, slightly overlapping bottom edge of greens with the top edge of the carrot. Applique on. 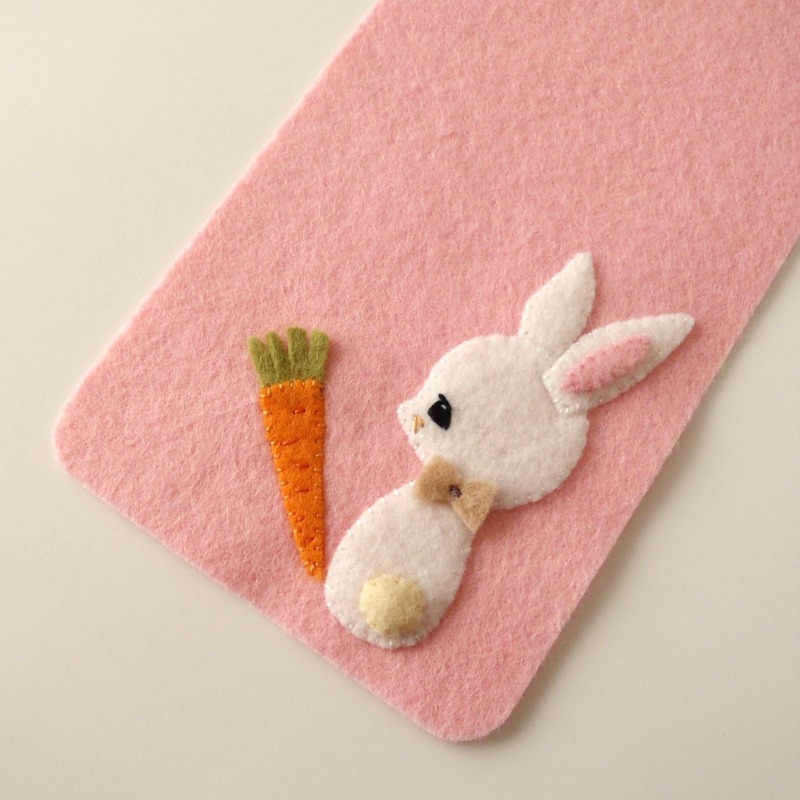 If you like, use a darker orange thread to embroider some straight stitches on to give the carrot some texture. It's wonderful. Thank you so much! Adorable! Maybe I can stop losing all my pencils now. Thank you for sharing these are just too cute!! So Cute! Thank you for sharing!! This is so cute, Shelly! I really love it. Thank you so much for sharing this with us. just totally adorable, thanks heaps. Wow these are so gorgeous and so beautifully made! is it just me or would you have placed the carrot in a different place? nevertheless, i'll be making some of these (sans carrots) for Christmas! Thanks! Thank you very much Shelly!! They are really cute!! Olá! Seus trabalhos são divinamente lindos. Thank you so much for the darling patterns! I'm just now finding your wonderful site. Thank you for the free pattern. Those are adorable. Thank you!! Do you have it posted elsewhere?